Electronic Funds Withdrawal – You can pay using funds from your bank account when your tax return is e-filed. There is no charge by the IRS for using this payment method, and payment can be arranged by your tax return preparer, allowing for e-filing of your return and submitting an electronic funds withdrawal request at the same time. Direct Pay – You can schedule and make a payment directly from your checking or savings account using IRS Direct Pay. There is no fee for this service, and you will receive an e-mail notification when the funds have been withdrawn. Payments, including estimated tax payments, can be scheduled up to 30 days in advance. You can change or cancel the payment up to two business days before the scheduled payment date. Electronic Federal Tax Payment System – This is a more sophisticated version of the IRS’s Direct Pay that allows not only federal income tax but also employment, estimated and excise tax payments to be made over the Internet or by phone from your bank account, with a robust authentication process to ensure the security of the site and your private information. This is a free service. Payments, which can be scheduled up to 365 days in advance, can be changed or cancelled up to two days prior to the scheduled payment date. You can use IRS Form 9783 to enroll in the system or enroll at EFTPS.gov – but do so well in advance of the date when a payment is due because the government will use U.S. mail to send you a personal identification number (PIN), which you will need to access your EFTPS account. Send a Check – You can also pay the old-fashioned way by sending in a check along with a payment voucher. The payment voucher – IRS Form 1040-V – includes the information needed to associate your payment with your IRS account. IRS addresses for where to send the payment and your check are included with Form 1040-V.
Pay with Cash – Taxpayers without bank accounts or those who would just prefer to pay in cash can do so by making a cash payment at a participating 7-Eleven store. Taxpayers can do this at more than 7,000 locations nationwide. Taxpayers can visit IRS.gov/paywithcash for instructions on how to pay with cash. There is a very small charge for making a cash payment, and the maximum amount is $1,000 per payment. But don’t wait until the last minute, as it will take up to a week for the IRS to receive the cash payment. If you are unable to pay the taxes that you owe, it is generally in your best interest to make other arrangements to obtain the funds needed to fully pay your taxes, so that you are not subjected to the government’s penalties and interest. Here are a few options to consider when you don’t have the funds to pay all of your tax liability. Credit Card – Another option is to pay by credit card by using one of the service providers that works with the IRS. However, as the IRS will not pay the credit card discount fee, you will have to pay that fee. You will also have to pay the credit card interest on the payment. Installment Agreement – If you owe the IRS $50,000 or less, you may qualify for a streamlined installment agreement that will allow you to make monthly payments for up to six years. You will still be subject to the late payment penalty, but it will be reduced by half. In addition, interest will also be charged at the current rate, and you will have to pay a user fee to set up the payment plan. By signing up for this arrangement, you agree to keep all future years’ tax obligations current. If you do not make payments on time or if you have an outstanding past-due amount in a future year, you will be in default of the agreement, and the IRS will then have the option of taking enforcement actions to collect the entire amount you owe. If you are seeking an installment agreement exceeding $50,000, the IRS will need to validate your financial condition and your need for an installment agreement through the information you provide in the Collection Information Statement (in which you list your financial information). You may also pay down your balance to $50,000 or less to take advantage of the streamlined option. Tap a Retirement Account – This is possibly the worst option for obtaining funds to pay your taxes because it jeopardizes your retirement and the distributions are generally taxable at the highest bracket, which adds more taxes to the existing problem. In addition, if you are under age 59.5, such a withdrawal is also subject to a 10% early-withdrawal penalty, which will compound the problem even further. Family Loan – Although it may be uncomfortable to ask, obtaining a loan from a relative or friend is an option because this type of loan is generally the least costly, in terms of interest. Whatever you decide, don’t just ignore your tax liability, as that is the worst thing you can do, and it can only make matters worse. Please call to discuss your payment options. “Where’s My Refund?” also includes links to customized information based on your specific situation. The links will guide you through the steps to resolve any issues affecting your refund. If you have questions related to your refund, please call us. As a reminder to those who have not yet filed their 2018 tax returns, April 15 is the due date to either file a return (and pay the taxes owed) or file for an automatic six-month extension (and pay the an estimate of the taxes owed). Caution should be exercised when preparing the extension application, which is IRS Form 4868. Even though this form is described as “automatic,” the extension is automatically granted only if it includes a reasonable estimate of the 2018 tax liability and only if that anticipated liability is paid along with the extension voucher. It is not uncommon for taxpayers to enter zero as the estimated tax liability without figuring the actual estimated amount. These taxpayers risk the IRS classifying their forms as having been improperly completed, which in turn makes the extensions invalid. If you need an extension, please contact us so that we can prepare a valid extension for you. The extension must be filed in a timely manner and we can file your extension electronically before the due date. If you are mailing an extension, be advised that the envelope with the extension form must only be postmarked on or before the April 15 due date. However, there are inherent risks associated with dropping an extension form in a mailbox; for instance, the envelope might not be postmarked in a timely fashion. Thus, those who have estimated tax due should mail their extension forms using registered or certified mail so as not to risk late-filing penalties. Individual Estimated Tax Payments for the First Quarter of 2019 – Taxpayers – especially those who have filed for extension – should be aware that the first installment of estimated taxes for the 2019 tax year is due on April 15. Taxpayers who fail to prepay the minimum (“safe-harbor”) amount can be subject to a penalty for the underpayment of the estimated tax. This penalty is based on the interest on the underpayment, which is calculated using the short-term federal rate plus 3 percentage points. The penalty is computed on a quarter-by-quarter basis, so even people who have prepaid the correct overall amount for the year may be subject to the penalty if the amounts are not paid proportionally or in a timely way. Federal tax law does provide ways to avoid the underpayment penalty. For instance, if the underpayment is less than $1,000 (referred to as the de minimis amount), no penalty is assessed. In addition, there are two safe-harbor prepayments:1. The first safe-harbor prepayment is based on the tax owed on the current year’s return. There is no penalty when the prepayments (including both withholding and estimated payments) equal or exceed 90% the owed amount. If your return is still pending because of missing information, please forward that information to us as quickly as possible so that we can ensure that your return meets the April 15 deadline. Keep in mind that the last week of tax season is very hectic, and your returns may not be completed in time if you wait until the last minute. If you know that the missing information will not be available before the April 15 deadline, then please let us know right away so that we can prepare an extension request (and 2019 estimated-tax vouchers, if needed). If you have not yet completed your returns, please call us right away so that we can schedule an appointment and/or file an extension. Talk about tax planning alternatives that could reduce your future tax liability. If you have questions about assembling your tax data prior to your appointment, please call us. https://tarlow.com/wp-content/uploads/2016/05/logo.png 0 0 Joanna Castle https://tarlow.com/wp-content/uploads/2016/05/logo.png Joanna Castle2019-02-04 15:17:042019-02-06 14:59:17Tax Time Is Around the Corner! Are You Ready? If you’re facing outstanding tax debt that you cannot pay, you may want to consider looking into an Offer in Compromise from the IRS. Specifically, an Offer in Compromise is an option offered from the IRS to qualifying individuals that allows them to settle tax debt for less than what they actually owe. Unfortunately, there seem to be a lot of misunderstandings about Offers in Compromise; many people falsely believe that these are seldom accepted by the IRS. In reality, it is estimated that the current acceptance rate is over 40%, with the average dollar amount of a settlement reaching more than $10,000. If you’re worried about your inability to pay tax debt, knowing the basic qualifications of an IRS Offer in Compromise and what to expect from the application process can be extremely helpful moving forward. Generally, there are three factors that are considered by the IRS when somebody applies for an Offer in Compromise. Most commonly, the IRS must have a belief that you will not be able to pay your tax debt off at any point in the near future. This means that your financial situation is probably not going to improve anytime soon and that the IRS would not likely be successful in forcing collections on you. At the end of the day, the IRS needs to believe they are getting a fair deal – so if you have any potential to pay your debt at any point in the near future, you may not qualify. You might also qualify for an Offer in Compromise if there is doubt as to your actual tax liability; if you have documentation proving that you owe less in taxes than the IRS believes to be true, or if an assessor has made a mistake on your reporting, you may be more likely to have an Offer in Compromise accepted by the IRS. Finally, if paying your tax bill would create a significant financial hardship, you may also qualify for an Offer in Compromise. Of course, proving financial hardship can sometimes be a challenge. IRS Form 656 – use this form to apply for an Offer in Compromise so long as there are no doubts as to your tax liability. IRS Form 656-L – use this form to apply if you are disputing your tax liability to the IRS. As you can probably see, the process of determining your eligibility and applying for an Offer in Compromise with the IRS can be quite time consuming and complex. This is where it can be helpful to consult with a tax professional for assistance. A qualified and experienced tax professional will be able to assess your current tax situation and give you a better idea as to whether or not going through the Offer in Compromise application process is worth your time and efforts. If so, he or she will also be able to assist you with the application process, ensuring that you’re filling out the correct forms and that you submit all required documentation as well. This can increase your chances of reaching a successful offer with the IRS and take a lot of the stress and burden off your chest. Even if you don’t qualify for an Offer in Compromise, your tax professional may be able to assist you in figuring out other alternatives for making your tax payment more financially manageable for you. This might include options to work out a payment/installment program with the IRS, among other options. Overall, getting an Offer in Compromise accepted by the IRS is nearly a 50/50 shot – but if you meet the eligibility requirements and take the time to correctly submit all paperwork and documentation, your chances of reaching an offer are high. And the best way to get the help you need in gathering this documentation and submitting this paperwork is to consult with an experienced tax professional. Schedule a consultation with us at your earliest convenience to get the ball rolling. https://tarlow.com/wp-content/uploads/2016/05/logo.png 0 0 Joanna Castle https://tarlow.com/wp-content/uploads/2016/05/logo.png Joanna Castle2019-01-07 17:18:352019-01-07 17:23:45Do I Qualify for an IRS Offer in Compromise? Because so many fraudulent tax returns were being filed right after e-filing opened up in January and before the old 1099-MISC due date at the end of February, the IRS had no way of verifying NEC. That opened the door for the IRS to be scammed out of millions of dollars in erroneous earned income tax credit (EITC). 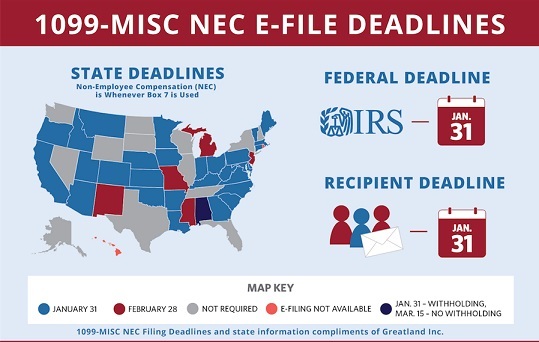 To plug that hole, the IRS moved the filing date for NEC 1099-MISCs to January 31 and no longer releases refunds for returns that include EITC until the NEC amounts can be verified. Thus, the due date for filing 2018 1099-MISC forms for NEC is now January 31, 2019. That is also the same due date for mailing the recipient his or her copy of the 1099-MISC. It is not uncommon to have a repairman out early in the year, pay him less than $600, use his services again later in the year, and have the total for the year be $600 or more. As a result, you may have overlooked getting the needed information from the individual to file the 1099s for the year. Therefore, it is good practice to always have individuals who are not incorporated complete and sign an IRS Form W-9 the first time you engage them and before you pay them. Having a properly completed and signed Form W-9 for all independent contractors and service providers will eliminate any oversights and protect you against IRS penalties and conflicts. If you have been negligent in the past about having the W-9s completed, it would be a good idea to establish a procedure for getting each non-corporate independent contractor and service provider to fill out a W-9 and return it to you going forward. The government provides IRS Form W-9, Request for Taxpayer Identification Number and Certification, as a means for you to obtain the vendor’s data you’ll need to accurately file the 1099s. It also provides you with verification that you complied with the law, in case the vendor gave you incorrect information. We highly recommend that you have potential vendors complete a Form W-9 prior to engaging in business with them. The W-9 is for your use only and is not submitted to the IRS. The penalty for failure to file a required information return such as the 1099-MISC is $270 per information return. The penalty is reduced to $50 if a correct but late information return is filed no later than the 30th day after the required filing date of January 31, 2019, and it is reduced to $100 for returns filed after the 30th day but no later than August 1, 2019. If you are required to file 250 or more information returns, you must file them electronically. In order to avoid a penalty, copies of the 1099-MISCs you’ve issued for 2018 need to be sent to the IRS by January 31, 2019. The forms must be submitted on magnetic media or on optically scannable forms (OCR forms). Note: Form 1099-MISC is also used to report other types of payments, including rent and royalties. The payments to independent contractors are reported in box 7 of the 1099-MISC, and the dates mentioned in this article apply when box 7 has been used. When the 1099-MISC is used to report income other than that in box 7, the due date to the form’s recipient is January 31, 2019, while the copy to the government is due by February 28, 2019. If you have questions, please call us to schedule an appointment. Tarlow & Co. prepares 1099s for submission to the IRS along with recipient copies and file copies for your records. Use the 1099 worksheet to provide us with the information needed to prepare your 1099s. https://tarlow.com/wp-content/uploads/2016/05/logo.png 0 0 Joanna Castle https://tarlow.com/wp-content/uploads/2016/05/logo.png Joanna Castle2019-01-07 16:41:272019-01-07 20:05:41The 1099-MISC Filing Date Is Just Around the Corner - Are You Ready? The most recent data from the IRS on individual tax returns indicates that of 131 million returns filed, about 5 million were expected to be amended. This comes to less than 4 percent, but that projection still affects a significant number of taxpayers. Filing an amended tax return can be a hassle that you definitely want to avoid if possible. But there are some situations where you’ll have to do so, and it’s prudent to seek out the help of a tax advisor who can guide you through the process. Here’s why you may need to file an amended tax return. 1. You made a math or data entry mistake and didn’t realize it until after you submitted your tax return. For example, you added up your charitable deductions, and after filing your return, you realize you added them up incorrectly, and the difference was sizeable. Filing an amended return can correct that math error and get a refund. Perhaps you were entering your gross income from your self-employed business into your software while it was late and you were tired, and you inadvertently transposed the numbers and entered the gross income as $78,000 when it was really $87,000. You will need an amended return to correct that error. However, you would not usually amend a return if you incorrectly entered W-2 income since the IRS receives a copy of the W-2 and will compare it with what you reported and if there was an error, they will automatically make a correction and send you a bill or a refund as the case might be. The IRS website instructs taxpayers not to amend a return in such a situation. The statute of limitations for refunds is three years for the due date the tax return and if the IRS has not automatically made the correction and you have a refund coming don’t let the statute of limitations expire before filing an amended return. That holds true for any situation were an amended return will result in a refund. 2. You used an incorrect filing status. Single parents, caregivers of elderly parents, and recently married or divorced people often make the mistake of using “Single” status when it’s the wrong one. “Heads of Household” miss out on crucial tax benefits, while married people will generally need to use “Married Filing Separately” if they don’t wish to file a joint return with their spouse. Because filing status affects so many elements of your tax return, you need to file an amended return to pay additional taxes you owe or receive a refund once the correct one is used. 3. You didn’t realize that there was a tax benefit you qualified for, and you’d like to claim it now. There are many frequently overlooked tax benefits a tax professional would be aware of that the average DIY person wouldn’t, such as the ability for most individuals and small business owners to make pension and profit-sharing contributions in a new year before the tax-filing deadline and still have it count for the current filing season. This also works in reverse in that people accidentally claim benefits they weren’t actually entitled to. Often, the best way to know for sure is to consult a tax professional. 4. You had investing activities that affect your tax return. Typically, you don’t realize a capital gain or loss until you actually sell an asset. But if securities become worthless, this results in a capital loss that needs to be reported the year it was deemed worthless, and not the year you discovered the fact. If this security was deemed worthless a long time ago, you may have to amend prior year returns to account for the capital loss. This can be significant since you are limited to deducting $3,000 in capital losses from all of your other income and result in capital loss carryovers that last several years. If you have any other investment losses that were forgotten or miscalculated on your original tax return, filing an amended return is the next logical stop to ensure your carryovers are done correctly for future tax returns. 5. You received tax forms after filing your tax return. If you were due a W-2 or 1099 form, you might not receive it when you’re initially preparing your taxes. It could be a surprise corrected form or the payer was just late sending it to you. But if you already filed your tax return, then got additional forms later on, amending your tax return becomes inevitable. Amending your tax return can be a cumbersome process, especially if you’re self-employed and/or have a great deal of investing activity. Asking a tax professional to assist you with filing amended returns can eliminate the headaches that come with the process. Many even offer a free review of self-prepared returns and ask the right questions to determine if it’s worth it to amend this year’s return and any prior years’. You may also have to amend your state tax return(s), which can grow more complex if your residency is or was multistate.